Nearly all other toothpastes contain SLS (sodium lauryl sulfate) and other irritating ingredients--even the "natural" ones and the children's toothpastes. 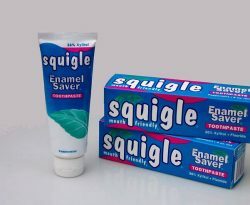 Finally, you have an alternative--Squigle Toothpaste was designed to be your Mouth Friendly® Toothpaste. It's free of harsh abrasives, stinging flavors, irritating tartar control agents and bleaches, and of course it's free of SLS and other irritating detergents. ...is a high performance toothpaste. ...will improve the quality of your life. Double blind clinical studies show that Squigle helps prevent gum disease and improve the condition of those who have it. Other research has shown that a xylitol-fluoride toothpaste, such as Squigle prevents tooth decay better than regular toothpaste. product have not been evaluated by the FDA. Harsh toothpaste ingredients may hurt your teeth and gums. Squigle Enamel Saver Toothpaste meets these standards. It's free of SLS and other irritating ingredients. For a more complete list of irritating ingredients to avoid, see Protect your Mouth: Avoid Harsh Toothpaste Ingredients. It contains 36% by weight of natural Xylitol--far more than any other toothpaste--to profoundly inhibit the growth of plaque. Plaque is an irritant that triggers canker sores. It can be used by people with canker sores and mouth ulcers because it doesn't cause further pain. It prevents tooth decay, gum disease, and bad breath better than your regular toothpaste. It tastes great--you'll love using it. Other SLS-free toothpastes taste weird or don't foam at all. Canker sore sufferers benefit more from SQUIGLE than from any other canker sore toothpaste. For best results, read and follow the Instructions for Canker Sore Sufferers. Use SQUIGLE® Toothpaste exclusively for 30 days. During this time you may have one last outbreak of mouth ulcers as your body rids itself of previous toothpaste irritants. It may take as long as 6 months to experience the full benefits of SQUIGLE. natural XYLITOL--far more than all other toothpastes. US Patents 5,496,541 and 5,900,230 and others pending. are registered trademarks of SQUIGLE, Inc.